In spite of the number of caravanners on the road these days there are probably few who know anything of the origin of their hobby and of touring caravans in general. The following article is by no means a complete history, but just a general background. Books can be found to fill in the gaps but are unfortunately very scarce some of which can be found on the publications page. Caravans go back well into the last century or even further if you consider purely a house on wheels. 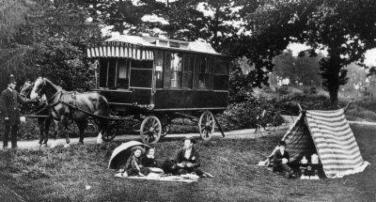 Although travelling showmen and later Gypsies took to the road in all sorts of horse drawn caravans in the early nineteenth century it is generally accepted that the first leisure caravan was Dr. W. Gordon-Stables’ “Wanderer”’. This was a purpose built 18ft design built by the Bristol Carriage Company around 1880 being based on their Bible Wagons. Dr. Gordon Stables was a writer of boys books and used the “Wanderer” as a mobile study whilst writing. Perhaps his most famous book as far as we are concerned is “The Cruise Of The Land Yacht Wanderer” which he wrote on his epic journey to Scotland. Many other “Gentlemen Gypsies” followed his example resulting in the formation of the original Caravan Club in 1907; Dr. Gordon Stables was it’s first President. Caravanning continued era with one or two exceptions until around 1919 when manufacturers decided that motor traction would be more convenient. Motor caravans, however, had appeared a little earlier, around 1915. The first Eccles trailer caravan appeared in 1919, a very primitive cabin on wheels. Bertram Hutchings, an established horse ‘van builder since 1912, followed in 1920. Piggots, mainly a tent manufacturer, also produced some interesting designs at the time using canvas in addition to solid panels. 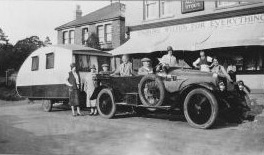 They were in fact the first to show exhibit trailer caravans at the Motor Show in 1920. Other makes of the period were Angela, Car Cruiser, Rice and Cheltenham. The 1920’s is perhaps the era people would generally think of when “Vintage Caravan” is mentioned; the designs evolving as the decade progressed into perhaps the most attractive of any era. 1930 saw a change, almost overnight, to the streamlined shape. Much of the exterior character and charm disappeared although the interiors remained in the 20’s style for a year or two. Whilst C. Flemming Williams had introduced streamlining on the tail of his Car Cruisers in the 20’s a streamlined front did not appear until the mid ‘30’s. The model which perhaps set the trend in full streamlining was Bertram Hutchings new “Winchester” design which appeared at the 1930 Motor Show. This was a tremendous departure from from his previous traditional models. Very few square ‘vans were built in the 30’s, those built were generally made to order. Angela, one of the older manufacturers, by 1931 was making some weird shapes. One in particular can be likened to an enormous fish: 18 ft long and complete with tail. During the 30’s the streamlined shapes continued to a greater or lesser extent, lantern roofs reappeared in 1932 but were curved in line with the main roof. As the years went on more and more features were incorporated in the more expensive ‘vans such as a bath under the floor, ventilated floor lockers, toilet compartments, gas cooking, hot and cold water systems, fold out extensions, built in radios etc. Throughout the ‘20’s and ‘30’s manufacturers supplied their caravans with complete with a set of china, very often purpose made, also cooking utensils and cutlery. As the 1930’s came to a close the ‘vans were generally getting larger and heavier until the outbreak of war when production virtually stopped. In the pre-war years caravanners were usually quite “well off” as not many people in those days could afford a car. In the literature of the time references to Lords, Ladies, Earls, Majors etc. within the caravan scene and being caravan owners, are quite common. Caravanning in those days was a much smaller scale pastime than it is today. During the war some caravan companies became involved in war work carrying out vehicle conversions, repairs and modification for the war department and other similar work. After the war materials were scarce, as was money, the resultant caravans made were therefore of a much more utilitarian nature. Most of the lantern roofs were gone with only a few exceptions in the more expensive models. The cheaper caravans proved to be ideal for emergency housing creating a different type of market more suited to mass production methods of manufacture. Caravans gradually became a source of cheap holidays especially when hiring on the growing number of caravan sites dotted around the country. 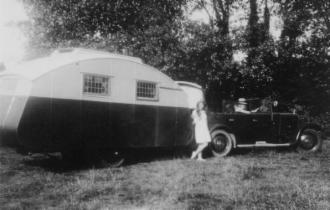 Touring caravanning has also grown far beyond the level experienced in the pre-war years. In recent years incomes have increased in real terms enabling many car owners to be able to enjoy what in years gone by was a very exclusive hobby. Our thanks should go to the pioneers of those far off days who laid the path for us to follow.